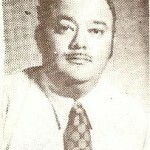 he Rotary year 1972-73 was significant in that after 33 years being non-districted, the Rotary Clubs of Guam, Tumon Bay and Saipan became a part of District 358. 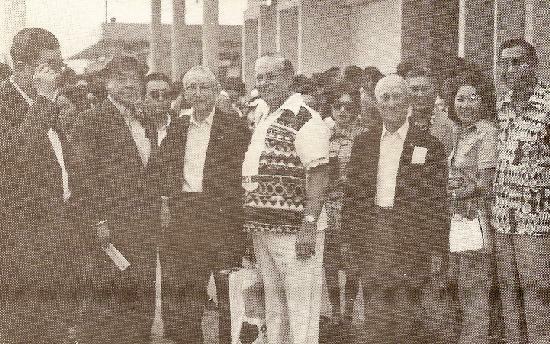 In his letter of 28 March 1973 to President Jerry of the Rotary Club of Guam, Governor-Nominee Takeo Sugitani of District 358, advised that at the District Convention in Tokyo, a resolution was passed welcoming our three clubs from the Marianas into Rotary International District 358, and that the cheers of the 2,000 members who attended the Convention indicated the warm feelings of welcome. Notwithstanding the great geographic distance and the language barrier, Governor Sugitani, with his warm and sanguine approval as a great Rotarian and leader, expressed the desire for friendship and brotherhood in the spirit of ideals of Rotary, which we genuinely appreciated. At the Board meeting on 17 April 1973, Rtn. “Mac” McAlister was appointed as the first Group II representative to District 358 by District Governor Suzuki. “A legend tells us that the inception of Rotary in Japan was seen in Dallas, Texas on the first day of 1918 when Umekichi Yoneyama was a New Year guest at the home of Rotarian Kisoji Fukushima. No evidences are left from the occasion that Rotary was in any way a major topic of conversation between the two. But when Frukushima returned home in Tokyo early in 1920, he was named a special representative by the then International Association of Rotary Clubs to organize the first Rotary club in Japan in Tokyo. The acquaintance that had been made with Yoneyama prompted him to request the leading banker on the board of the Mitusui Bank to recruit leaders I business and profession for membership of the club he was assigned to organize. “Being aware and conscious of internationality associated with Rotary, Umekichi Yoneyama endeavored successfully to invite business and professional leaders of the national level to join with him in the new club, known as Rotary. As a result, the Rotary Club of Tokyo was organized on October 20, 1920 with 20 charter members who were known to be leaders in their respective fields and to be internationally trained and minded. The tradition of high membership quality was immediately inherited by the second Rotary Club in Japan in Osaka about two years later and has since been handed down to date in spite of the warring interrupting for 9 years from 1940 to 1949. “On September 1, 1923, Tokyo and its vicinities were hit by a big earthquake, leaving Japan’s capital in debris. From the disaster, however, Tokyo Rotarians had a rare opportunity to see the world of Rotary in action. Relief funds immediately started to pour in from Rotary International and as many as 503 Rotary clubs in 17 countries, amounting in total to 89,161.12 Yen which in the present value of the currency corresponds to some 300,000,000 Yen or over $1,000,000. With the funds the Rotary Club of Tokyo undertook the first largescale community project, realizing perhaps for the first time the world fellowship and unity of Rotary. It was also the opportunity to be aware of the vast potentials of Rotary and to take steps for Tokyo Rotarians to be active and willing participants in the world movement. There are reasons to believe, as seen in the weekly meeting then established, that a Rotary Club was established in the true sense of the world in Tokyo by the Kanto Earthquake. “Umekichi Yoneyama, founder of the Rotary Club of Tokyo, was named Special Commissioner in Japan in 1942 to serve for two years. He was elected a director of Rotary International in 1926 and governor of the newly organized District 70 in 1928 to serve until 1931. In the meantime the club hosted the Second Pacific Conference in 1928 to rank among the leading Rotary Clubs in the world. Looking at the history from a different angle, it was Umekichi Yoneyama who led Japan’s Rotary in its first decade to be now officially and familiarly known as the Founder of Rotary in Japan to remain for many years to come in the hearts of Japanese Rotarians, through, for example, the rotary Yoneyama Memorial Foundation, a nationwide international student program. “In 1930, Prince Iesato Tokugawa, speaker of the House of Peers and an honorary member of the Rotary Club of Tokyo, was one of the speakers at the Silver Anniversary Convention of Rotary in Chicago. He pleaded to world Rotarians to understand Japan for the first and last time. In spite of the visit in Tokyo of Founder Paul Harris in 1935, the second decade of Rotary in Japan only saw the years go by under the increasing pressures from the military. In 1940 Rotary Clubs in the Japan proper, Taiwan, Korea and Manchuria were forced to disband. 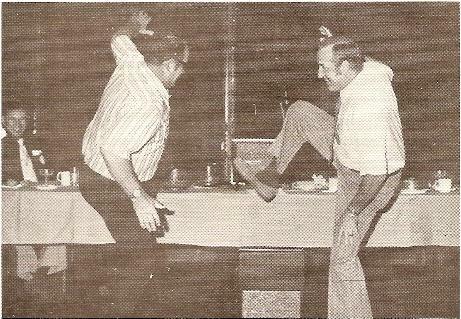 Several of the former Rotary clubs in the country, including the one in Tokyo continued to meet under the disguised name through the warring days. 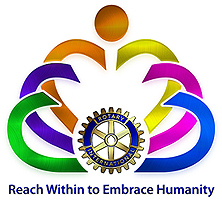 “The back-to-Rotary movement immediately started after the war. Considering sad memories of the war not to be forgotten as easily as Japanese might want to see, the re-admittance of Japan in the fold of Rotary came far sooner than expected. Through farsightedness and belief in the magic power of Rotary., world Rotarians re-admitted Japan as early as in March, 1949, and seven Rotary clubs were established in Tokyo and six other cities. “The reorganized Rotary in Japan was soon found to be different form what it was in the Pre-war days. It was democratized in the sense that it started penetrating into smaller communities and adding clubs in bigger cities. Rotary in Japan since 1949 has been characterized by a series of continuous extension. Seven clubs in 1949 had been expanded to 509 clubs and 21,724 Rotarians to host the 1961 convention of Rotary International in Tokyo. During the following decade the number of Rotary Clubs and Rotarians in the country were doubled now to count more than 1,140 clubs and about 60,000 Rotarians. In the process of democratization, Rotary has helped democratize Japan through leaders in its fold in communities and the nation. “The 1961 Tokyo Convention is still on record as the largest Rotary event in history with the total registration of 23,366. The great success of the convention was achieved only through the miraculous deed of accommodating 7,355 overseas visitors with a very limited hotel accommodation then available. It was a great opportunity for world understanding particularly for Japanese Rotarians who awoke to the world potentials of Rotary. 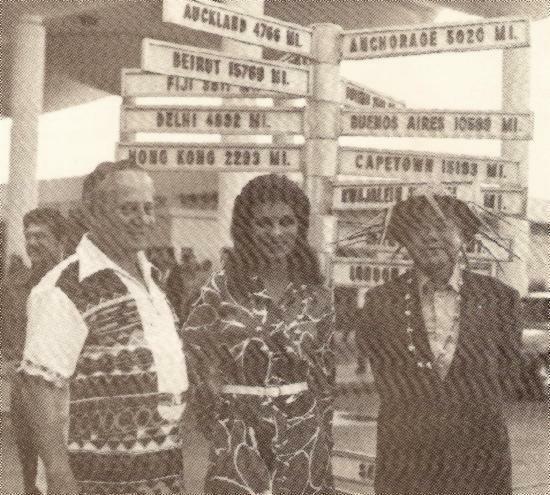 While Japanese Rotarians do not claim the convention to have been the greatest of its kind in the history of Rotary, they are still proud to have hosted a convention that has remained in the fond memories of Rotarians and friends around the world. “Rotarians in Japan are seen to be very active in all fields of service. They are particularly mindful of opportunities in world understanding. 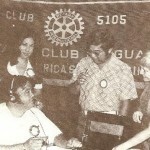 In the year 1971-72, they contributed to The Rotary Foundation to the extent of $980,000 or about $18.15 per Rotarian, an average for above other Rotary areas and countries. In District 358 alone contributed to the world organization during the same year a sum close to $150,000 for per capita average of $37.75 next only to the average of over $42.00, as achieved by the neighboring District 359 per Rotarian. I am happy and proud to have been sponsored by District 358 for the Rotary award, selected out of some 160 applicants in Tokyo. The final paragraphs of this brief history truly indicates the Rotary spirit of friendship and international understanding which District Governor Sugitani was so sincere in promoting, which we Rotarians in the Marianas firmly believe laid the successful foundation now attested to by the representative delegation from Japan attending our 40th Anniversary celebrations. Apparently District 358 jumped the gun a little, as while Governor-Nominee Sugitani’s letter was dated 28 March 1973, Secretary Harry A. Stewart’s letter dated 4 August 1972 advised that decision of the Board of Directors of Rotary International to include Guam and Saipan in District 358 with the boundaries of the District including Guam, Japan, that portion of District 358 including metropolitan Tokyo and Okinawa prefecture, and Saipan, would become effective 1 July 1973. Other important events which occurred during PP Jerry’s administration was the economy class dinner given by Pan American Airlines at the Cliff Hotel using the airline utensils with the Pan American stewardesses serving the meal, after which the Pan American Divisional Vice President for the Pacific, Ed Swofford, made an excellent presentation. The annual soap box derby sponsored by the Guam Rotary Club, Chevrolet and Atkins Kroll was held at NAS for the last time in Guam. At this event, the President of the Rotary Club of Guam traditionally raced the Commanding Officer of the Naval Air Station in a soap box racer; however, on this occasion the Rotary Club had to concede to NAS as PP Jim Underwood and President Jerry were unable to fit into the small soap box racers. The soap box derby was a great incentive to the youth not only to create and build their own racer but also to inculcate the competitive spirit and the discontinuation was a great loss to the community. After the clubs in the Marianas become Districted and during PP Jerry’s administration, PP Bud Theisen, PP Brandenburg, PP Jerry Perry and Rtns. Karl Hauser, Jimmy Shintaku, Hugh Barton, Herb Dumont and Mac McAlister attended their first District 358 meeting at the Imperial Hotel on 9 June in Tokyo, and proceeded on to Karuizawa to visit our Sister Club where 3 enjoyable days of golfing, touring and fellowship with the Karuizawa Rotarians were experienced. The sad note nearing this administration was the death of Vice President Richie Cehon and his wife in an airplane accident in Taiwan. The end of the Jerry Perry year was topped off with a half-gallon martini being presented to the outgoing president at the change in administration. Because they knew the whereabouts of a certain bee. And dashed to the boonie…Pell mell.